The U.S. relationship with Saudi Arabia is in the news a lot recently. The killing of journalist Jamal Khashoggi, coupled with the Saudi military action against rebels in Yemen, has prompted many in Washington, D.C., to condemn the Saudi regime. Many members of Congress are speaking out against Saudi Arabia, with some trying to take legislative action to punish the nation. Let’s take a look at where the members of the Arkansas congressional delegation are in this debate. One of the leading senators taking an anti-Saudi stand is Rand Paul of Kentucky. He recently authored a resolution that would have disapproved the sale of U.S. missiles to Bahrain. That nation is part of the Saudi coalition that is fighting rebels in Yemen. There is a lot of evidence that this military action has killed civilians and committed other actions that violate human rights. Senator Paul’s resolution to stop missile sales would not directly affect the Saudi-led coalition, but it would have sent a signal about U.S. displeasure. By a vote of 77-21, the Senate killed a motion last week that would have allowed the Paul resolution to be considered by the Senate. 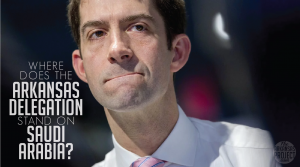 Both Senators Tom Cotton and John Boozman voted to table the resolution. In other words, they both voted in favor of missile sales to Bahrain. Last year, Sen. Paul authored another resolution that would have prohibited the export of warplanes to Saudi Arabia. That vote was much closer than the vote last week, with 47 senators voting to consider the resolution and 53 opposing it. Both Senators Cotton and Boozman voted against considering the Paul resolution — that is, they both voted in favor of arms sales to Saudi Arabia. We have a long-standing partnership with Saudi Arabia, going back to FDR and the original King Abdul Aziz meeting on a battleship in World War II. And the reason we have that partnership is that we have common interests and common adversaries. So although I deplore the death of Jamal Khashoggi and their consulate in Istanbul, we should not take action that’s going to undermine that partnership and ultimately only empower our enemies, countries like Iran or empower countries like Russia and China. In the end though, this relationship is about more than just a single king or crown prince in Saudi Arabia and more than about a single president in America. That’s why it goes back for 70 plus years. It’s about keeping the American people safe and it’s about defending our interests in the Middle East. There is also a variety of legislation in the U.S. House dealing with arms sales to Saudi Arabia, calling for an end to military activity in Yemen, or withholding aid to Saudi Arabia. None of the members of the Arkansas House delegation have cosponsored these bills. They also declined to take a stand on what the U.S. reaction to the Khashoggi murder should be.